Train right at your company with +Connect – a series of training courses led by live instructors via mediated telepresence. The Center for Business & Industry at South Central College, in collaboration with partner colleges throughout Minnesota, is offering a new program called +Connect – a series of training courses led by live instructors via mediated telepresence. Employees can train right at their company, making +Connect ideal for incumbent workers and those in apprenticeships or dual-training programs. Visit the MnAMP website to learn more. 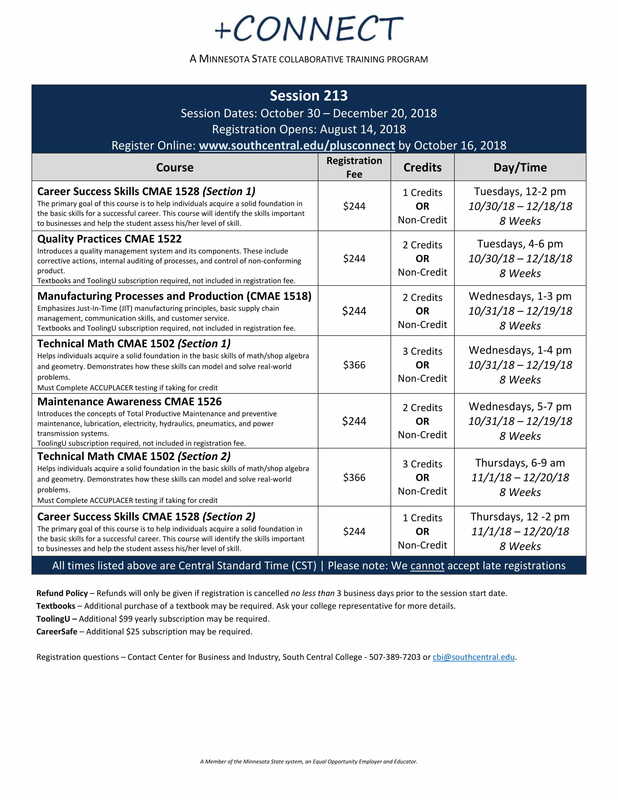 In-session courses are listed below. Registered students will receive three emails. Students will receive an email confirmation of their registration along with important information on how to access the virtual classroom via the web along with a link to the student handbook. If this email does not show up in your inbox, please check your spam or junk folder. Students will receive an email with a personalized link to claim your StarID. If you have previously taken a +Connect class with us, please utilize the StarID that you were previously assigned. Students will receive an email with the telepresence connection information upon the close of registration for this class. ALL class times listed are Central Standard Time.